Durga Puja is the most awaited festival of West Bengal, spanning over four days at a stretch. It is not possible for everyone in the community to organize it of their own. A Durga Puja is organized by a group of people in a locality thence being known as Sarbojanin Durga Puja. Initially, Durga Puja was celebrated only in affluent and zamindar families of West Bengal. Then Barowari Puja came into existence. The word "Baroyari" is derived from "Baro" and "Yaar" ie. a group of twelve friends. Guptipara in Hoogly was the first place in Bengal where the idea of "Baroyari" or "Sarbojanin" puja was conceived in the year 1790. It took 120 yrs. for "Baroyari" Durga Puja to reach Calcutta. The first organiser of "Baroyari" Durga Puja in Calcutta was "Sanatan Dharmatsahini Sabha" of Behala, Shakher Bazar. The overwhelming enthusiasm and participation of common people increased the number of "Baroyari" Durga Puja through out the state. With lapse of time, the Barowari Puja was renowned as Sarbojanin Durga Puja. The word Sarbojanin comprises of two words: “Sarbo” in Bengali (Sanskrit) meaning “for all” and “Jan” meaning “people”. So the word Sarbojanin means For All People. The Sarbojanin Puja understands no restrictions in respect of Colour, Creed, Caste or Class. The “Bhog” distributed after Puja is taken as a blessing of Goddess Durga with equality and compassion. During Durga Puja, entire streets of West Bengal are covered by Huge Structures called “Pandal”. It is a structure made of bamboos and cloth, used as a temporary enclave for the Goddess. Each Pandal has its own theme based on current affairs, historic events, work of fiction, work of Art or of any other innovative ideas. These Pujas are organized by committee which represents certain group of people or locality. The expense of the Puja is raised by collecting funds known as “Chandaa” through door-to-door visit, concert, advertisements etc. On the time of Puja, the Ritual drummers – “Dhakis” carrying large leather-strung Dhak – show off their skills during ritual dance worships called Aarati. The Puja is performed traditionally in these Pandals. Many idols in Pandals are bought from Kumartoli, were the artisans live situated in North Calcutta. 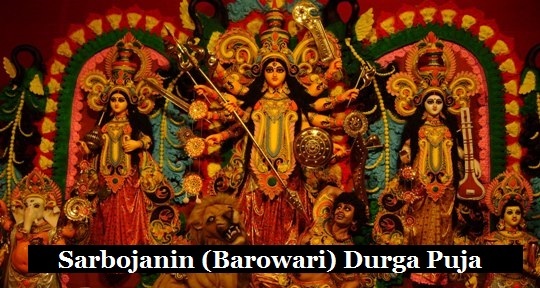 Sarbojanin Durgotsav, as we know it today, started off much later in Kolkata, in the 1920s, with Shimla Byayam Samiti and Bagbazar being the earliest. In 1926, Atindranath Bose commenced ‘Sarbojanin’ Durga puja in which anybody, irrespective of caste, creed and religion, could participate in the festivities. This was organized to instill a feeling of unity and brotherhood. At present hundreds of Pujas are held in the city’s lanes and streets. The puja in recent years are more focused on lighting and decoration. They spend Lakhs of money to make their Pandals an Award-winning one. The communities have different prizes for different categories such as Best Puja, Best Idol, Best Pandal, Best Lighting etc. This form of Puja is also flourished in other states and countries of the world.